Not this time. I hope. Good news! Jerry is almost back. Bad news! He’s not back yet, so you’ve got to put up with me on substitute duty again. More bad news! Kentucky isn’t going to be the rollover game we all wish it would be. Read on. What’s at stake: For Auburn, a lot. Just as with South Carolina, a loss to an inter-divisional opponent doesn’t completely shut out hopes for a trip to Atlanta. A conference loss would certainly hurt, but as long as it isn’t to a team named Arkansas or Alabama, where the tiebreaker would be killer, Auburn’s chances of winning the SEC West would still be very much alive. Still, Auburn needs to win this game. Never mind that a loss would wreck the team’s momentum going into the Arkansas – LSU – Ole Miss stretch. Forget that a feeling of deja vu after last season’s 5-0 start and sudden loss might send the team into another downward spiral. On top of all that, and everything else that would result from a loss on Saturday, a loss actually would pretty much crush our hopes of making it to the SEC Championship Game. The reality is, if Auburn can’t beat Kentucky, coming off a game against ULM, then we really don’t have much business hoping for an SEC title run in the first place. Mathematically, we would still have a shot. But realistically, we could pretty much write it off. That being said, as Jerry pointed out earlier today, a win on the road against a tough SEC opponent would pretty much solidify where we think our Tigers are at this point. For Kentucky, it will be their chance to prove their worth at home, under the lights, on national television, against the #8 team in the country, and beat Auburn twice in a row for the first time since ever. When Kentucky has the ball: They’re going to throw it in the flat. Then they’re going to throw it in the flat again. And when they’re done throwing it in the flat, they’re going to throw it into the flat one more time. They’re going to throw screens, they’re going to throw bubbles, and they’re going to throw wheel routes. It’s what they do. And it’s the exact nickel-and-dime short passes stuff that Arkansas State and Clemson absolutely gashed the Auburn defense with. When they run the ball, they’re going to run tosses with Derrick Locke stretching the field and getting to the corner. Even when they call a run up the middle, Locke is going to bounce it outside and look for the corner. And that’s the exact kind of stuff that you would expect will gash the overpursuing Auburn defense. This is a bad match-up for Auburn on this side of the ball. Kentucky’s quarterback is Mike Hartline, a 6’6″ senior. If you’ll remember, he missed last year’s game against Auburn due to injury. This is his third year with significant starts, so he has experience. He’s a serviceable enough quarterback, and he does what they ask of him. But really, when he’s not throwing short underneath passes, he’s just closing his eyes and heaving it up there and hoping one of his talented receivers comes down with it. Their running back, as we all know, is senior Derrick Locke. He’s a downhill runner, running low to the ground but with deceptive speed. Kentucky will do anything they can to get him out in the open field, including tosses and, yes, passes to the flats. His backup is Raymond Sanders, a true freshman who is basically a carbon copy of Locke. We’ll be seeing a lot of him too, as Kentucky rotates their backs. 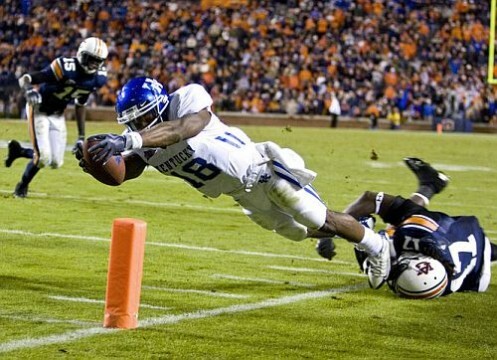 But Kentucky’s best offensive weapon, and best overall player by far, is junior wide receiver Randall Cobb. He is, of course, the guy that pretty much single-handedly beat Auburn on that final drive last year in Jordan-Hare. Cobb is everything for the Kentucky offense, and I do mean everything. He’s a receiver, he’s the kick returner, he’s the punt returner, he’s the wildcat quarterback, and he’s even the kick holder. He’s the single most versatile player in the country right now, and Bynes and company on defense will have to find him and point him out before every single snap. He started four games at quarterback during his freshman year, and they still put him under center in their wildcat packages. Hell, sometimes they just throw him in there in a regular formation, and run a play with a run/pass option. The point is, you’re going to see him all over the field, and you’re going to be sick of hearing Bob Davie gushing over his versatility before the game even starts. But where he is most dangerous, and where Kentucky is most talented, is at receiver. Cobb isn’t just a deep threat — he’s also a Terrell Owens type that isn’t afraid to go over the middle, or catch underneath passes and break some tackles. Playing opposite him is senior Chris Matthews, a 6’5″ receiver who Tommy Thigpen compared to A.J. Green earlier this week. While South Carolina’s tall receivers never actually did much with their size against Auburn (which isn’t too much of a suprise seeing as how Etheridge and Savage are contact safeties at heart), it would be foolish to write off Matthews and only worry about Cobb. To say that these Kentucky receivers present a challenge to the struggling Auburn secondary is a severe understatement. And when you combine their nickel-and-dime passing attack with the Auburn defense’s “bend-but-don’t-break” (or rather, “break-but-don’t-shatter”) philosophy, I wouldn’t be surprised if Kentucky is able to sustain long, brutal drives each time they touch the ball. The challenge for the Auburn defense will be to keep Kentucky out of the end zone at the end of those long drives, and to force some turnovers and end a few of those drives before they even get started. When Auburn has the ball: I don’t know what to make of Kentucky’s defense, really. The Kentucky secondary leads the SEC with the fewest passing yards allowed per game, and that’s after games against John Brantley and Jeramiah Masoli. They also have a couple of studs in the front seven in linebacker Danny Trevathan and defensive tackle Mark Crawford. And if it weren’t for the Kentucky offense giving up three turnovers in its own territory against Ole Miss, the Kentucky defense would have looked better last week against a potent Ole Miss offense that has their collective heads on straight now. Speaking of last week, they did a fairly good job at stopping Masoli’s scrambling ability, and there’s no reason to think they won’t do as good a job against Cam Newton. Still, I just don’t see how they’re going to be able to stop Auburn if the offense is on their game. Kentucky is eleventh in the conference in rush defense, so it would be a shock if Auburn’s four-headed rushing monster didn’t have a big day. And since Kentucky has forced just five turnovers in five games this year, Auburn should be able to hold on to the ball as long as they’re smart with it. The challenge here will be for Auburn to sustain some long, time-consuming drives to counter the ones Kentucky’s offense will put up. It will be interesting, because this is something that the offense hasn’t yet really proven that it can do on a consistent basis. But if it becomes a track meet, then it becomes a track meet, and the Auburn offense has to match Kentucky’s blow-for-blow. While Kentucky draws a good matchup with its offense against Auburn’s defense, the same can be said about Auburn’s offense and Kentucky’s defense. Things might be a bit more interesting when Auburn’s defense is on the field, but it still feels like the game is going to come down to this side of the ball. When special teams are on the field: It’s all about stopping Randall Cobb. Cobb is a dangerous kick returner, a dangerous punt returner, and a dangerous kick holder, too. This is one of those games where we can’t afford a major special teams blunder, so the kick coverage teams have got to be on their game. As far as kicker’s go, Kentucky’s kicker Craig McIntosh has a pretty interesting story, as a walk-on who drilled field goals from 50 and 42 last week. Still, I’ll take Wes Byrum, thanks. Advantage Auburn in that department. trap game (tr-ap geym) noun. — A term used to describe a forthcoming hazardous game, in which a team plays an otherwise inferior opponent, usually on the road, and overlooks the opponent because they play Arkansas the next week. Oh, you’d like it in a sentence? Sure! Intangible reason for confidence: Revenge. You know revenge is on the mind of these players, and the coaches have probably been playing it up all week. The players were embarrassed and demoralized by the loss to Kentucky last year, and now they smell blood, they have vengeance on the mind, and they’re fired up and ready to go up to Lexington, dominate, and hang a basketball score on that basketball school. Wait, that’s not the players, that’s me. Well, hopefully the players feel the same way. 1. A couple of long, sustained, clock-killing drives. Obviously it’s not Auburn’s way of doing things on offense, and it certainly isn’t their strength, but it looks like it’s something they’re going to have to do to win this game. And, hey, if they can’t do it against this Kentucky defense whom they match up well against, well, they’re never be able to do it. 2. Force two turnovers. Again, this isn’t so much a wish, as it is a key to the game. Auburn’s defense is going to need to get off the field however it can, and forcing turnovers is its best chance at doing that. And, let’s not forget, on the other side of the ball, the offense can wear down that mismatched Kentucky defense if its given some opportunities. We could use some turnovers. 3. No big plays for Cobb on special teams. Contain him on kick returns, contain him on punt returns, and contain him when he’s the kick-holder, too. This guy has big play written all over him. Success is / failure is: A win / a loss. This is SEC football, baby. We’re on the road, against a dangerous and very solid SEC opponent, in primetime on national television. We’re playing against a team with senior leadership at quarterback, the SEC’s second leading rusher at tailback, and a superstar at receiver. Our opponents are fired up, upset-minded, and they know how to beat us. This is what we signed up for. SEC football. This is going to be a tough game. But championship teams win tough games. Regardless of what UK does I really think this game hinges on our offense. Do we continue to see an offense that is relatively free of turnovers and drive killing penalties? If so we win going away. Otherwise all bets are off and we might get drilled. I prefer to think that ziemba and the rest of the o-line have been meditating all week about no false start or holding calls and that all ballcarrier have been forced to carry a football around campus this week (see The Program). Best case scenario is we start fast and NEVER take our foot off and give the nation and the remainder of our opponents alot to think about. In reality, we probably start fast and then go to ground-n-pound in the second half to salt away the win, protect Cam, yada yada. Don’t get me wrong, ground-n-pound can still score, but I think they revert somewhat to the style of the MSU game where we tried to keep Our D off the field…or in this case, their offense! I’m nauseaus after reading that. Where oh where is my Maalox? Okay, earlier I responded to the “Two Brief Thoughts…” article and thought maybe I had been too harsh. Now, I’m even-headed and saying: You must be daft. You must be off your rocker. You must have forgotten everything that these tigers have done this year. How can you seriously sit there and publish an article so blatantly sensationalist? I don’t think you even believe the junk that you just wrote. Yes, Kentucky is a trap game, yes playing on the road in the SEC is tough, but would I ever call this game anything other than a rollover game? No. 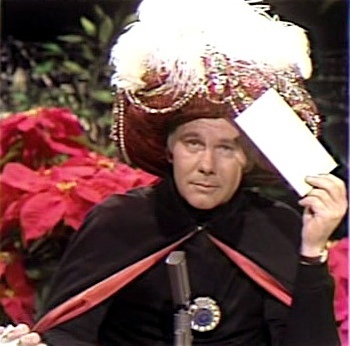 Did you write it to get a rise out of people like me in an attempt to bring some excitement to a game that will ultimately result in an anticlimactic simple win for the Tigers? Did you write this because you honestly just didn’t have anything else to write about 24 hours before Auburn rolls over an inept Kentucky defense? Or do you actually believe this crap? Do you honestly think that a few impact players in skill positions could easily outmatch a balanced and dangerous Auburn team with experienced, smart, and powerful veterans at almost every position? You quite literally just said that a one-trick pony of a Kentucky offense is going to give Auburn fits? You also just said that Kentucky is going to show us the same thing that Clemson and Arkansas State showed us, and yet somehow they’re going to do what those two teams didn’t. I’m sorry, I’m not buying it. Kentucky does not match up well against us. Here’s a story for you: this weekend, the nations #8 Rushing Offense goes up against the nation’s #83 Rush Defense. And just like South Carolina led the nation in Rush Defense before they faced us, Kentucky is going to find out what happens when an unstoppable force meets their right guard. And that would be Nick Fairly continuing to lead the SEC in sacks. JohnnyAuburn, I don’t get why your posts seem so intense, and almost hateful. Of course the blog is overhyping this week’s opponent, that’s pretty much standard. Even the overconfident Bama fanbase has plenty of bloggers every week that write about how they’re worried about Ole Miss or Georgia or somebody like that. Given the standard overhyping, I think Justin’s post is a pretty good evaluation. Yes, I believe Auburn’s the better team and that tomorrow will be a blowout. However, I can think of at least 10 times in the last 5 years off the top of my head, where the same was true, and posts like yours were probably all over the internet, and Auburn went out and lost the game. Not the least of which is last year’s Kentucky game at home. I think Kentucky’s a better team than Mississippi State this year, and Auburn beat Miss. State by all of 3 points on the road a month ago. I think Auburn’s improved a lot since then, but it’s no sure thing. Have you had a chance to read Jerry’s post on expectations from the day after the Clemson game? I’ve talked about that with friends as one of the best college football pieces I’ve read this year. The only reason I mention that, and the only reason I’m writing this post, is because you seem like one of those people that’s going to be angry if Auburn only wins by one touchdown tomorrow instead of four. That’ll destroy your enjoyment of the season, and it’s not an attitude that’s good to spread around. We can agree to disagree, I guess…either way, enjoy the game tomorrow. I think Justin has nailed the weaknesses of our defense. We give up short passes and we have trouble with quick guys who can get to the outside. We do control the middle, however, which is why we shut down Lattimore and Ingram. So Cobb is exactly the kind of guy who will give us fits. That being said, we will pound the ball down their gullets and there ain’t a thing they can do about it. Dyer will have an important day, Cam will make their heads spin, and McCalebb will work the outside. Auburn’s ground attack alone will be too much for them. Our success on the ground will assist our passing game. So I think we win this time. Last year was a fluke caused by a combination of factors, the most important being lack of depth on defense. And then we made drive killing penalties, turned the ball over, and had weak punts which gave the Wildcats good field position. I doubt all of those bad things will happen this time. JohnnyAU, Justin’s just trying to fill in for our main man WBE. The fashion of the post is in the spirit of what we usually get on Friday anyway. I can definitely understand your sentiments though. I think on paper this should be a big win also. But you never know what may happen on a Saturday night. All the sh*%, their coaches and players have been talkin this week about knowing how to beat this team, and other comments like Cam is the only player they need to focus on has got me fired up. I hope the game plays out like it’s supposed to: an utter beatdown by a top 10 AU team over Kentucky. Wow, was I wrong about this team. Thank God I can’t predict anything. I thought the Clemson game did us in…no way. We can stand toe to toe with Bama. Yo, Johnny Auburn. What were u saying?